2 delicate crisscrossed magnetic lashes for a natural and beautiful finish. Micro magnetic and lightweight for use with Glam By Manicare® Magnetising Eyeliner. 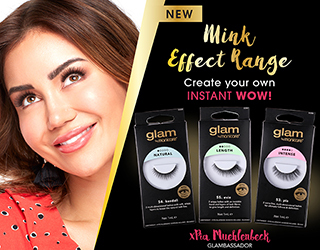 Glam By Manicare® Magnetic Lashes are lightweight with discreetly placed micro magnets for optimal contact and staying power. Use in conjunction with Glam By Manicare® Magnetising Eyeliner, a revolutionary technology containing invisible magnetising particles to take lash application to a professional level. Step 1: Try on Glam magnetic lashes to check fit and trim if needed without cutting off outer magnets. Step 2: Apply Glam By Manicare® Magnetising Eyeliner on the top of eye lid along natural lash line. Leave to dry for 60 seconds. Step 3: Using your thumb and index finger lay down magnetic lashes on top of liner and click into place. No gluing required. 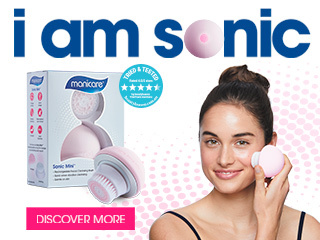 Glam By Manicare® Magnetising Eyeliner sold separately. For best results use your fingertips to apply lashes with ease. Avoid using metal tweezers. To remove lashes, gently peel off eyelid using your index finger and thumb. Store lashes in tray provided after use to extend life of these lashes. Keep out of reach of children. Contains small magnets.